First I apologize for not capturing what site this information came from. But wow is this a cool time-saving idea. The author preheated the oven to 400°F degrees. Then he or she mixed up a favorite meat loaf recipe in a large bowl and then gently spread it all out in a 9x13-inch baking pan so that it made one large patty of even thickness. The tines of a fork were used to poke holes throughout the meat. It was baked for 30 minutes. The author said that as this bakes, the meat will shrink away from the sides and liquid will accumulate around the edges of pan. When fully cooked, the pan is removed from the oven (keeping the oven turned on) and all liquid is carefully drained off. Then the author topped the meat with an even layer of sliced cheese and returned the pan to the oven for about 2 more minutes or until the cheese melted. The pan was removed from the oven and allowed to rest for a few minutes. 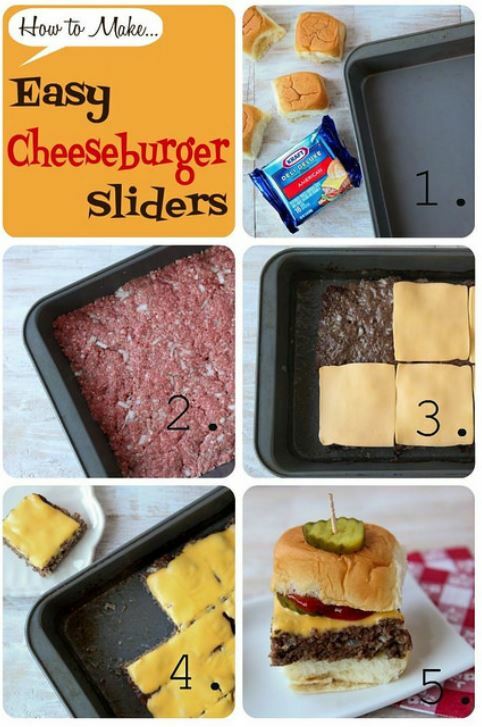 The author cut this huge cooked patty into 2-inch squares (or the size of the buns used), making 12 mini- hamburgers. It was served with dill pickle slices and other typical slider fixings. I noticed that one reader left a comment that the ground beef was too greasy so she substituted ground turkey and the problem was solved. I can hardly wait to try this at our next family gathering! Next up is a snazzy idea for a 60-second cookie. Once again, I forgot to capture which site I was on, and I apologize to the creator of this neat idea (it might be The Daily Crave, but I’m just not sure). But what she did with three simple ingredients is impressive. She said this will bring you an eternity of pleasure…or at least a few seconds of escape into a euphoric candy bar-like paradise. She made “sandwiches” from slightly salted and perfectly crunchy Triscuits® with chunky peanut butter smeared in between the crackers. Then she dipped them in melted chocolate (milk or semi-sweet—it doesn’t matter which). “Ooooooh” is what all her lucky testers had to say. Again, I can hardly wait to try these. Finally, there was an idea I found that was meant for Easter festivities, but shoot, these could be decorated for any holiday. And this time, I did remember to note which site this idea came from: The Daily Crave(dailycrave.wordpress.com). 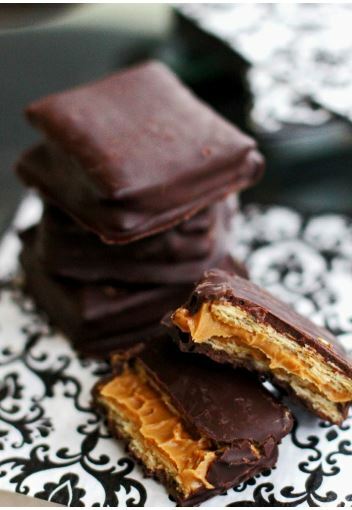 Natalie Lewis, creator and blog author, came up with a similar cracker idea but instead of using Triscuits®, she uses a buttery cracker, such as a Ritz® or Hi-Ho®. She also spreads peanut butter between the crackers, but her special spin? 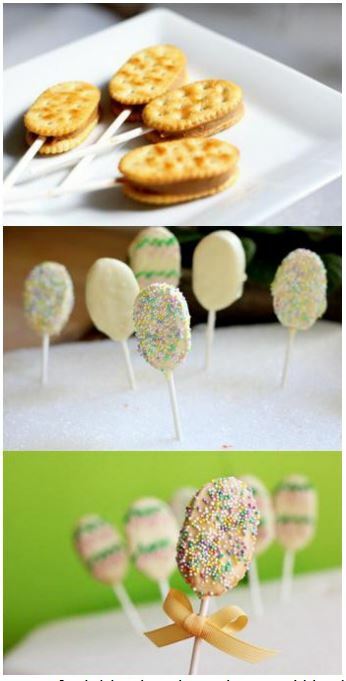 She inserts lollipop sticks into each “sandwich” and then dips them in melted white chocolate and rolls them in sprinkles. Although too late for doing this for Easter, I’m thinking they’d be perfect for our upcoming Memorial Day picnic. I’ll roll them in those candy decorations that look like little flowers, I think. Do you have some clever and quick kitchen creations you do for your family? We’d love to hear about it, so please share. Cook’n readers are some of best and most clever cooks we know!